Wigan coach Shaun Wane has named his squad for the Super League Grand Final. Wane has kept the same 19-man squad and had already indicated he will stick with the same 17-man panel which beat Castleford 14-0 in their semi-final, meaning no place for Gabe Hamlin or Taulima Tautai. 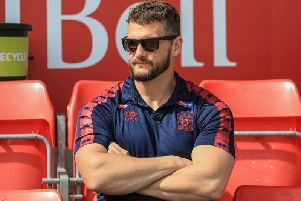 Wigan’s 19-man squad: John Bateman, Tony Clubb, Tom Davies, Morgan Escare, Liam Farrell, Ben Flower, Oliver Gildart, Joe Greenwood, Gabe Hamlin, Tommy Leuluai, Dom Manfredi, Romain Navarrete, Sean O’Loughlin, Sam Powell, Dan Sarginson, Ryan Sutton, Taulima Tautai, Sam Tomkins, George Williams. Warrington coach Steve Price has named an unchanged 19-man squad following last week’s semi final win over St Helens.